This letter is a few days late because it’s been a crazy, chaotic week. Just hours after taking your 21 month pictures, we had to take Grayson to the hospital and he was there until yesterday afternoon. You were such a little trooper, staying with many different people this week- all who love you to pieces and took such good care of you. I missed you so much though, and hope we don’t have to do that again for a really long time. 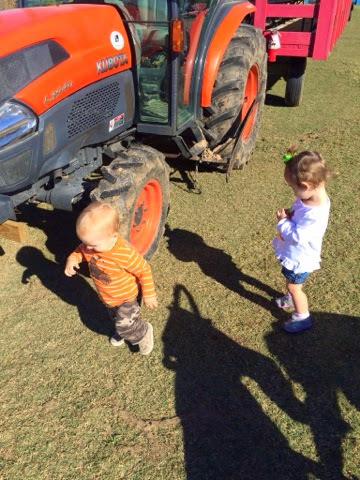 Today when we dropped Grayson off at school, you started crying and saying his name- I think you really missed him too. 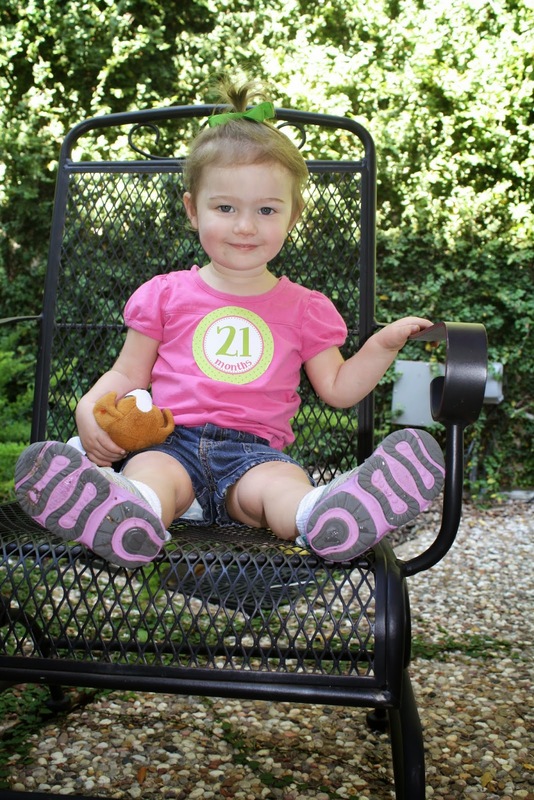 I can hardly believe you are already 21 months- just three months away from turning two. Wow! 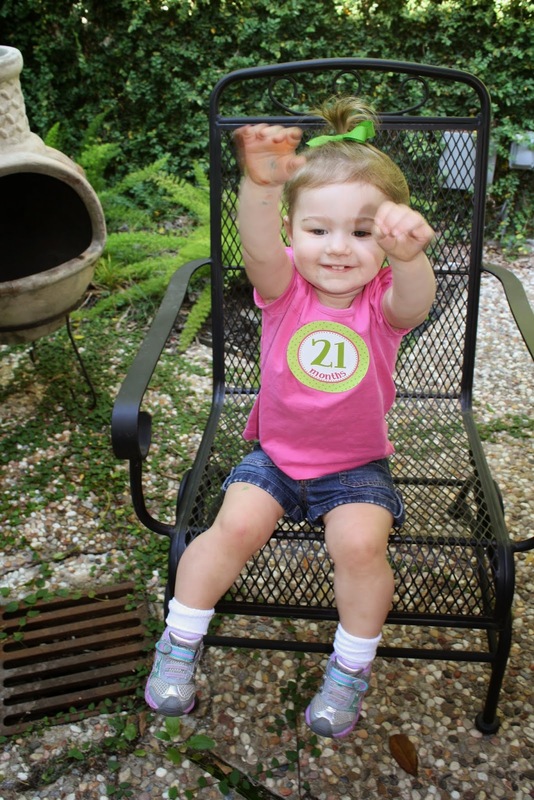 Your second year has completely flown by. Sleep 12-13 hours a night and take one nap, usually about 2 hours. Take 3 bottles of milk a day- at bedtime, naptime, and early in the morning if you wake up before I’m ready for you to. Have completely crazy hair, and I’m trying to figure out how I’m supposed to style it in this awkward, in between baby and normal hair stage. The sprout ponytail on top of your head is our go-to for now. Say the most adorable things. My favorite is when you randomly say “Bless you, Mommy”. You also say “Yes, please” and “Thank you” pretty consistently and in the right context. Finally have a security object. 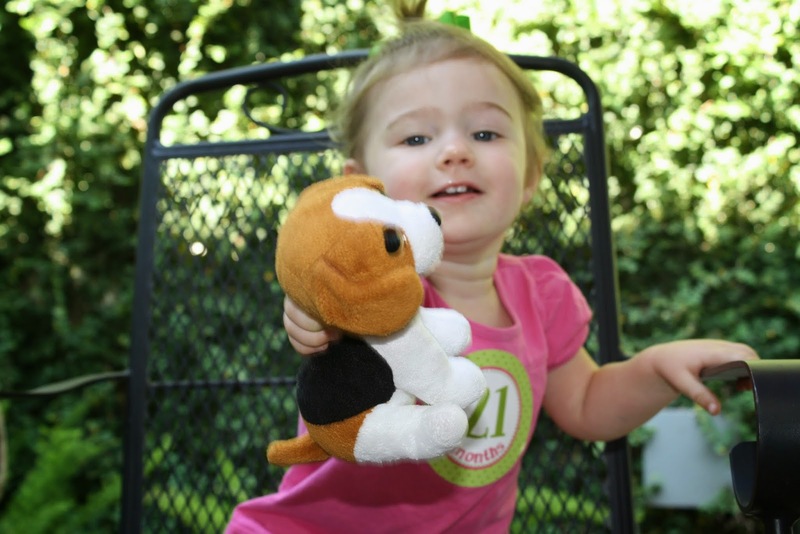 About a month ago, we took care of your cousin Theo’s dog Milton for a few days, and they gave you a stuffed “Milton” as a thank you. Now, you won’t go anywhere without Milton. He sleeps with you, rides in the car with you, and has to watch you eat your meals and take your bath. Charlotte, you are just the best. Thank you for making me laugh and being so, so sweet. I love you. It was bound to happen- Grayson got really sick and had to be hospitalized this week. Lately I’d been saying how great Grayson was doing to everyone who asked, and we had a really great appointment with his Mito specialist last Friday, where even she commented how great he looked and how he was responding so much better than he had been in previous visits. I know this is just what happens- Grayson never gets just a little sick, so any “little” bug that hits the rest of us with minor illness lands him in the hospital. I know I really didn’t jinx anything, but that’s sure how it feels. Monday, I got a text from G’s teacher that he had had a seizure. I wasn’t really worried, because he’s had many seizures at school. But then when she texted me that he’d had a second one and turned blue, I got a little worried. I called his doctor who said if he had a third one, to take him to the ER. He did have a third one late in the afternoon, but I waited for a few hours to take him in so we could eat dinner, bathe him, and avoid rush hour traffic. On the way to the hospital, he had another seizure in the car. This was really overwhelming for me- that hasn’t ever happened before. I didn’t pull over because it was dark and I didn’t feel safe, plus he was completely strapped in his carseat so I knew he wasn’t going anywhere. When that seizure was over, we were almost to the ER and he projectile vomited twice, all over himself and the car. The ER was more packed than I’d ever seen it. Bored and want some good people watching? Go to the ER- wow. They took us right back and eventually, after 3 tries, got an IV started. Since the hospital was so full, we had to wait hours and hours for a room. While we were waiting, G had a fifth seizure- a really intense one. He was making awful yelping noises and stopped breathing, and he turned blue and his oxygen stats plummeted. It was terrifying. Thankfully, the seizure stopped with IV medication and he was able to get his stats back up with supplemental oxygen. After almost 8 hours in the ER we finally were taken to a room at 3:15 am. I got less than 2 hours of sleep and was barely functioning the next day. After a night of fluids, Grayson looked a ton better although he was still vomiting some. His doctor ordered an MRI, but unfortunately the hospital only had one working MRI machine so it kept getting pushed back. He didn’t actually have the MRI until late Wednesday afternoon. We thought we’d be able to go home after the MRI, but when Grayson came out of anesthesia, he was in a lot of pain. His foot was really swollen at the IV site, so that may have been it, but his blood sugar was also really low. The anesthesiologist strongly recommended we stay another night, and I agreed. When we got back to the room, Grayson became hysterical for about 30 minutes. He was obviously in pain, and now his blood sugar was too high. I was sure he was about to have a seizure because he was doing a lot of seizure-type movements with his body, but he didn’t (at least one that looks like his typical seizures). They called in the neuro team to examine him, and shortly after that he fell asleep for the night. Yesterday morning he woke up back to baseline and I was sure we’d get to go home soon after. The discharge paperwork was being processed when the neuro team came back again. Grayson put on quite a show, dramatically vomiting green bile all over himself and the doctor. That earned him another four hours of observation, 3 of which he slept through. We did get the results of the MRI: no significant change from the last one done last year, although it did show some “normal” brain atrophy consistent with his diagnosis of Leigh Syndrome. I want to cry thinking about it even now- how is brain atrophy ever considered normal, and how long can he go on with yearly brain atrophy? We got home about 5:30 yesterday afternoon, and the way Charlotte was punishing me for being away all week (almost) made me want to be back in the hospital. She kept hugging and kissing her brother and cried when we dropped Grayson off at school this morning- she sure missed him. Mommy can’t do anything right though- ha! Thank you to everyone who helped make this week a little easier on us- those who took such good care of Charlotte, brought us food and parking money, came to visit, provided lunch and dinner, prayed, texted and commented on Facebook. We love you all and you are SO appreciated! I’m having writer’s block lately and not much inspiration for this blog. Actually, I could write 3 blog posts a day if I had a computer that could somehow transcribe my thoughts as they came to me. For 22 hours of the day, I really want another baby. During the hours of 3:30-5:30 pm, all I want is wine. I need to write a blog post of all the hilarious things my toddler says and does. Last night, not so hilarious when she woke up hysterical three times because she couldn’t find her stuffed dog in her crib (he was in the corner each time). So consequently, I slept a total of about four minutes last night. But, I did reintroduce myself to Gilmore Girls during my insomnia, and I really had forgotten how good that show is. I turned 35 on Monday. My best friend sent me a picture of us when we were 22. Um, yeah, I look a lot different now. OLD. 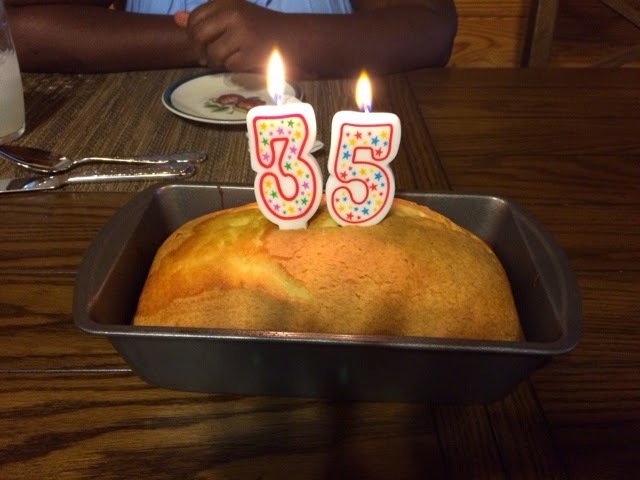 We went to the ranch last weekend and made a birthday pound cake for me and G’s nurse, who also turns 35 next week. Pound cake with no icing- it was my birthday and that’s what I wanted. In general, I don’t really like movies (I much prefer television series) but we went and saw Gone Girl the other night and I loved it. It was just like the book, which I also loved. It doesn’t matter how thoroughly or how much time I spend cleaning, if we are home more than six consecutive minutes, it’s destroyed. But the good news is, there’s no longer water dripping from the ceiling! My little sister got engaged on Sunday! 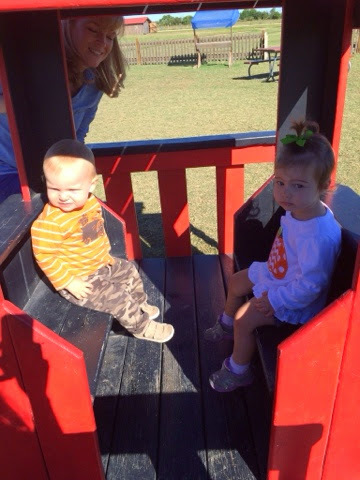 My sister in law and I took the kids (minus G) to a farm yesterday. 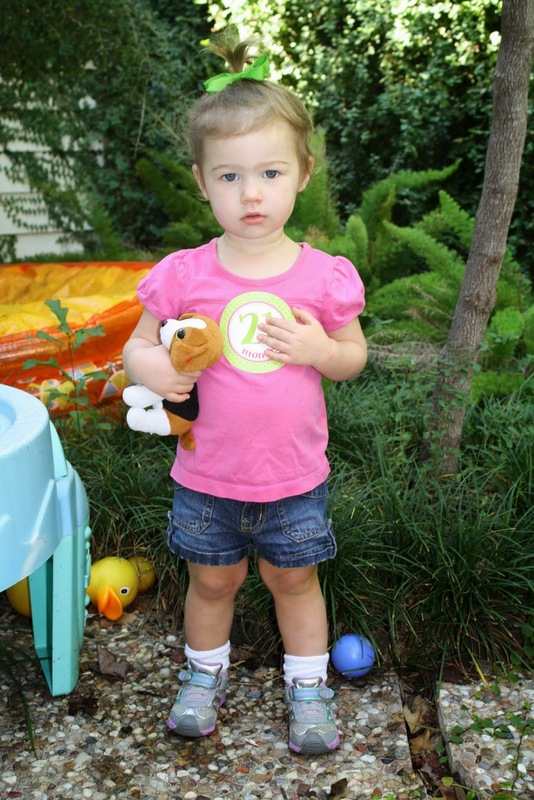 Toddlers are so cooperative and enthusiastic about posing for pictures. 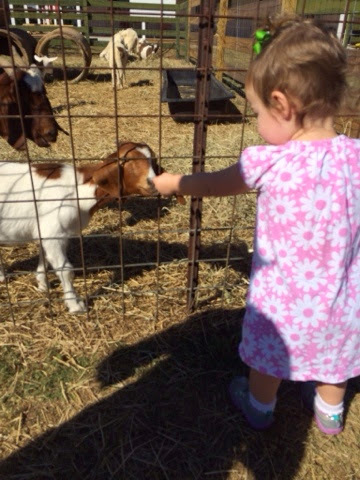 But they do love goats. I really need to start taking more pictures of G again- even if he looks awkward, and even if he doesn’t smile. He is just the sweetest- he just wants to be held, hugged, kissed and sung to. And he’s doing so, so well. He has an appointment in the morning with his Mito specialist, and I’m really hoping for no surprises. It’s Scandal night! Will you be watching?!? It’s been a really stressful week, and my body is responding with fatigue- the best way I can describe it is it feels like I have a newborn- that deep, my limbs feel like they are made of lead kind of tired. When I finish this post, I know I’ll be really tempted just to leave the dishes, the toys and the laundry and just crawl into bed- at 7:30 pm. After an emotional Sunday due to a negative personal situation that’s been ongoing, I woke up Monday morning to water dripping from Grayson’s ceiling. I called Ryan, who then took the day off to have a plumber come out. Then, as I was backing out of the driveway to take Grayson to school, I hit the side of the garage with my sideview mirror, and it shattered. Because of course. Back at the house, the plumbers were stumped. So $350, a ripped up toilet and 3 holes of missing sheetrock later, we still had water dripping from the ceiling. In other words, a really expensive “I don’t know”. Yesterday, we had a roofer come out to see if the roof was leaking. No, but apparently we do have $650 worth of roofing that probably needs to be done. And yes, there was still water dripping from the ceiling. Today, we had an AC repairman out. Two hours later, he had unclogged two drain pipes and the dripping stopped. And he didn’t charge us anything for the work. Bless him. Hopefully, this has fixed the problem, although he did say the pipes are old and corroded, which makes me really nervous. And now we have to replace a toilet and sheetrock. Sigh. This house has been good for us- it’s what we need for now- the size, layout and location. Oh, but I wish it wasn’t such a money pit. Yes, expensive house problems are super stressful, and I’m not going to lie and say I didn’t have several meltdowns about it this week, but this is nothing compared to the stress some of my dear friends are facing this week. For those of you who read this post, Melanie passed away earlier in the week. I did not know her personally, but I and many of my friends were touched by the work she did while she was on earth. And then yesterday, one of my best friends lost her father in law to cancer. Also, another good friend’s child had surgery yesterday and is having a tough recovery, and two of my Mito mom friends’ kids are in the hospital and struggling. And to top it off, another very close friend got some devastating news about her daughter’s health. Yes, I have A LOT of friends with sick kids. It’s messed up. What in the world is going on? I almost feel guilty about my stress and worry over a leak in my house when so many others I am close to are hurting so deeply right now. It does put so much in perspective I realize so many people are struggling and dealing with so much. I have really been reflecting today on what a huge blessing it is that Grayson is doing so well and has been doing well for quite a while. And while I still obviously have my own crazy life situations to deal with, these past few months of G’s stability has given me the chance to finally catch my breath and really get the chance to be the one offering support, and not the other way around. And that feels right- that all I’ve gone through the past few years has made me able to help others, both practically and emotionally. I’m praying next week brings better health, better news, and dryer ceilings in my world.